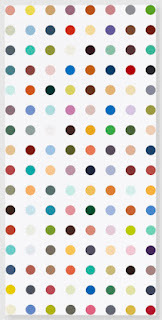 Damien Hirst's "The Complete Spot Paintings 1986-2011" exhibit at the Gagosian gallery is almost closing and it would be a shame not to take your young art critics to view the perfectly executed spots of beautiful colors on white canvases of circular, rectangular or square shapes. While the theme is repetitive and it may feel like you are viewing a paint factory archive the colors are vivid and the space is large and it works for viewing up close or at a distance. Mr. Hirst's artist statement says that he has a phenomenal love of color. There are more than 300 paintings to prove this and they can all be seen until February 18 th in New York, Paris, London, Rome, Geneva, Athens, Hong Kong, and Beverly Hills. The best part of the experience will be getting the kids take on it. Perfect for all. (C) Damien Hirst and Science Ltd. All rights reserved, DACS 2011. Courtesy Gagosian Gallery. Photography by Prudence Cuming Associates”.